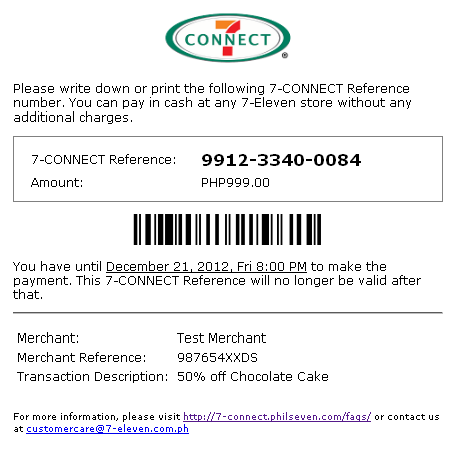 You can now pay for online purchases at any 7-Eleven store. Just check if the site offers the 7-CONNECT payment option. If your favorite site doesn’t have 7-CONNECT yet, let us know. There is no need for a credit card to be able to get that fantastic deal for a voucher. You don’t have to type in credit card numbers, expiry dates and billing addresses to buy something. Just write down the 7-CONNECT Reference and go the store to pay. You will be given an acknowledgement receipt and you are done. It’s that easy! The merchant immediately receives a confirmation of payment and can proceed to fulfill your order. Unlike a bank deposit, there is no need to fax or go to another site to complete the payment. Your merchant should be able to deliver your voucher or e-ticket within a few minutes.